Red Ryder was a comic-strip cowboy created by writer Stephen Slesinger and artist Fred Harman. 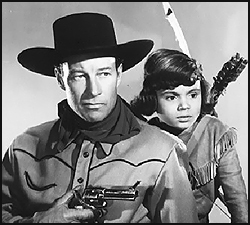 Red Ryder premiered in the Sunday funnies on November 6, 1938, and soon grew into one of the largest franchises in entertainment history. In the 1940s, there was nary a kid-friendly product that didn’t have a Red Ryder tie-in; comic books, novels, Big Little Books, a radio show, and the infamous Red Ryder BB Gun, which is still in production today despite the fact that Red Ryder hasn’t appeared in newspapers since the 1960s. For thousands of baby boomers, the Red Ryder BB Gun wasn’t the only way to put an eye out, but it was the most universal. 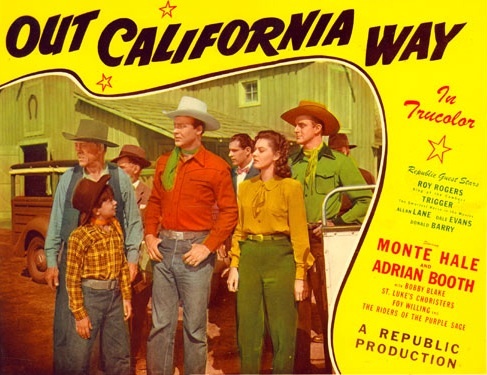 Colorado Pioneers begins in Chicago, where Red Ryder and Little Beaver run afoul of a couple of ragamuffins who today would be called “at-risk youth.” Red Ryder intercedes on their behalf in court, and frees them from a life of petty street crime by taking them back to the Colorado ranch run by his aunt, “The Duchess” (Alice Fleming), where he teaches them the value of hard work and fresh air. Originally planning to take just the two boys who stole his money (Billy Cummings and Freddie Chapman), Red Ryder is convinced by Little Beaver to take the whole gang, including a token black member named “Smokey,” who is played by Billie “Buckwheat” Thomas (yes, he’s the Buckwheat you’re thinking of). The situation may be hokey and formulaic, but Elliott is a strong enough presence to make you believe it when the kids start following his lead. The emotional core of the film is the most recalcitrant boy, who resists Red Ryder’s mentorship, but who can’t resist a frail colt, which he feeds and talks to in secret. The boy’s journey from a hardened little thug to a young man who is able to care for something weaker than himself and tell the truth even when it’s difficult makes for a surprisingly moving story. Colorado Pioneers is an excellent little B western. While it’s aimed at kids, Elliott is believable and tough enough as Red Ryder for adults to enjoy the film, too. 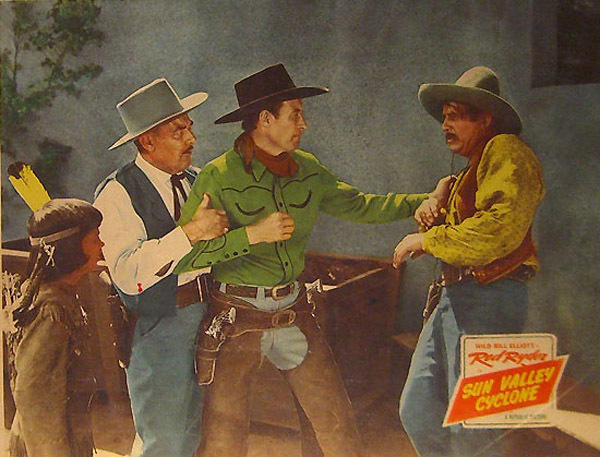 He’s not quite Henry Fonda or Randolph Scott, but he’s one of the better western stars you’ve probably never heard of. Posted in 1945, November 1945 and tagged Alice Fleming, Bill Elliott, Billy Cummings, Bobby Blake, Buckwheat Thomas, Bud Geary, Bud Thackery, Colorado Pioneers, Earle Snell, Emmett Vogan, Frank Jaquet, Fred Harman, Freddie Chapman, George Chesebro, Little Beaver, Monte Hale, Murray Seldeen, Newspaper Enterprise Association, Peter Whitehead, R.G. Springsteen, Red Ryder, Republic Pictures, Richard Cherwin, Robert Blake, Roy Barcroft, Sidney Picker, Stephen Slesinger, Tom Chatterton, Tom London, Westerns, Wild Bill Elliott. Bookmark the permalink.